What is different about managing in the public sector? What can managers do to cope with these differences? Why are public sector managers so often unfairly maligned? And what can the private sector learn about management from the public sector? In this radical yet practical book, Alexander Stevenson analyses what makes public sector management so difficult, so vital and so fulfilling – and why relying on private sector management techniques is not enough to manage effectively in the public sector. Drawing on the experiences of successful public sector managers he sets out the alternative ways of meeting the challenges of managing in such a difficult environment. There are useful tips and anecdotes on issues such as: creating accountability without a bottom line, setting targets, managing risk, stimulating innovation, making decisions, managing people, and working with politicians. If you are a public sector manager seeking ways to improve what you do, then this book is a must-read. But it will also be interesting and useful for private sector managers who want to understand more about the public sector, and for general readers with an interest in management or the public sector. 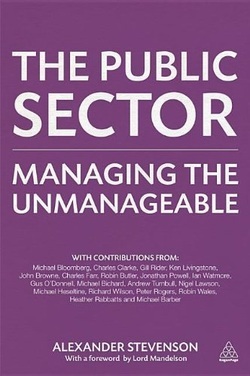 The book has a foreword by Peter Mandelson and insights based on interviews with more than sixty successful public sector managers including: Michael Bloomberg, Brendan Barber, Sir Michael Barber, Lord (Michael) Bichard, Lord (John) Browne, Lord (Robin) Butler, Helen Carter, Sir Merrick Cockell, Charles Clarke, Lord (Geoffrey) Dear, Brian Dinsdale, Charles Farr, Lord (Charles) Guthrie, Lord (Chris) Haskins, Lord (Michael) Heseltine, Ken Livingstone, Paul Martin, Lord (John) Monks, Lord (Gus) O'Donnell, Sir Robert Naylor, Jan Parkinson, Sir Hayden Phillips, Jonathan Powell, Heather Rabbatts, John Ransford, Gill Rider, Paul Roberts, Sir Peter Rogers, Stephen Taylor, Lord (Andrew) Turnball, Sir Robin Wales, Nick Walkley, Ian Watmore and Lord (Richard) Wilson.